In April of this year, I was lucky enough to lead an intimate dinner event with some ‘movers and shakers’ up to big things. Kathi Suprata was among my honored guests. We shared a fabulous meal around a gorgeous dining room table. And our conversations were around how to raise our voices and make big impact. Toward the end of the evening as we were wrapping up the event, we talked about the big, bold actions we were going to take as a direct result of spending that magical evening together. Big, bold intentions were shared. And it was exciting and inspiring for all of us. Then, Kathi serenaded us with one of her original songs — ‘The What Could Have Been Blues.” Just weeks later, Kathi went to see her doctor. She had been experiencing low grade fever and discomfort and asked her doctor to diagnose the problem. The diagnosis in this case is cancer. Kathi has an amazingly upbeat attitude to her situation and is inviting magic and miracles to manifest. I want to do my part. Please send healing energy, magic and miracles in the direction of Berkeley, California where Kathi and her fiancee are making plans to beat this thing. If you have been delaying doing anything in your life or work until SOMEDAY instead of taking action NOW, I hope Kathi’s song — ‘The What Could Have Been Blues’ — is the wake-up call you need to move forward. Make the most of TODAY and speak and sing your message so it can be heard to make the impact you are here to make. >> Finally, if you lead live events anywhere in the USA and want to bring Kathi’s music to your stage, I know Kathi would be honored and thrilled to inspire your tribes to say YES to the right opportunities that can bring their dreams alive today. Watch her joy and listen to the lyrics. They will get you straight to the heart. 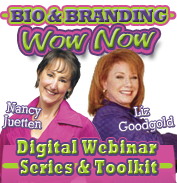 Enjoy a full length VIDEO presentation to make your bio more client attracting. Just click here, and you are all set! If you want to turn one of your videos into an evergreen webinar, Stealth Seminar is the service I use. They make it so easy. Try it. Do You Ask for Testimonials Systematically? Let Me Make It Easy for You! I’ve always made a practice of asking for testimonials. Within the last few months, I set up a special page on my blog that makes it systematic for me to ask and easier than ever for clients to reply. I learned this from Info Products Guy James Roche, and it has been working beautifully. Here is a link that I send to happy clients as soon as our appointments are complete, at the precise time they are feeling especially fabulous about our work together. Most clients are only too happy to reply by sending in their photos and their favorable testimonials. Why not put something similar in place for your business by adjusting the language on this page to be a perfect fit for what you offer? My good friend and colleague and a happy client Alice Cunningham, co-owner of Olympic Hot Tub Company, always says, “You have to make it easy to buy, easy to own, and easy to refer.” An ongoing flow of glowing testimonials certainly can make it a whole lot easier for your ideal clients to “get to yes” faster. And, when they do, you are fast on your way to do more of the work you love. Late last year, I followed a tip from Alice Cunningham to share a testimonial about good results I experienced with paid advertising with the vendor. That testimonial I provided to Help a Reporter Out Founder Peter Shankman ended up on the pages of Inc. Start-Up Toolkit Blog! The lesson here? One good thing most always leads to another. All this is to say that as wonderful as it is to receive testimonials, it is also fabulous to give quality testimonials. especically when the impact of someone’s work on your behalf is so meaningful. Authentic Visibility Tip of the Day: Take a moment to send a quality testimonial to someone in your business network who is making a significant impact on your success. Then, tell me what happens next! No doubt, good things will unfold in ways too priceless to count. So many people ask me about the time-tested and proven resources I use and recommend to earn expert status and execute many of the initiatives that drive my business forward. Today, you can visit “The N List” tab at this blog to see an extensive list of the vendors and services I use to do a whole variety of things. From my favorite online press kit provider to my favorite graphic artist to my favorite local business journal, I never recommend a product or service I haven’t used myself to enjoy remarkable results. Check out the list and see if the solution to a problem you are experiencing in your business can be solved with these resources. As I learn of and use additional resources that can lend fuel to your DIY publicity and online visibility success momentum, I’ll update the list. Enjoy. And, let me send a word of thanks to Book Publishing Expert Dan Poynter, who writes an informative and helpful newsletter about self publishing. He advocated for the Bye-Bye Boring Bio Action Guide to his readers in today’s edition. Love that. Thanks Dan! If book publishing is on your list, sign up for Dan’s ezine.